The original meaning of the verb “to compete” is “competere,” which means “to strive together.” Today, however, many of us think of competition in terms of rivals and contention. Photographer Kevin Garrett suffered a brain injury when his car was struck from the rear on his way to a photo shoot. David Johnson, a competing photographer, learned about the accident and that Garrett was having difficulties. He cleared his schedule and flew from his studio in New York to help Garrett learn how to use some new equipment. Calling forth our character strengths when surrounded by colleagues who have traded in character for winning at all costs can require courage. Professional photography is known to be a cutthroat business and, over the years, Johnson and Garrett have gone on to compete directly for jobs at times. They’ve astonished some of their clients by recommending each other for jobs, loaning each other equipment, and sharing names of crew members in a business where people jealously guard every aspect of their business. 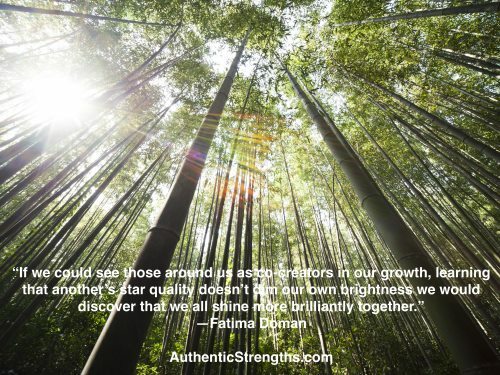 Character strengths are the most important aspect of ourselves that we want recognized and understood by others. They are collectively responsible for our greatest achievements and fulfillment. Positive psychologists have identified twenty-four of these strengths—the basic building blocks that represent our individuality, psychologically speaking. We each possess all twenty-four in varying degrees and combinations. These strengths are universally valued around the world and scientists define them as positive traits that are beneficial to self and others. They lead us to positive emotions, relationships, and into engaging and meaningful activities where we flourish—at work and in life. The tide is changing. Greedy, aggressive behavior is quickly exposed these days. Successful leaders know that character is where the edge is—encouraging their people to put their authentic strengths to work to build a better whole. Peterson, Christopher, and Martin Seligman. Character Strengths and Virtues: A Handbook and Classification. American Psychological Association, 2004. Photo of two competitors that inspired millions taken by the Piqua Daily Call photographer Mike Ullery.